Sean Dyche praised his side’s control as they turned in one of their finest performances of the season to significantly ease any relegation worries. Burnley came from 1-0 down to win 3-1 at Bournemouth and climb to 14th, eight points clear of Cardiff in 18th. The sides meet on Saturday at Turf Moor, when the Clarets could effectively seal survival, but Dyche was delighted with the way his players responded to an early Ashley Barnes own goal, to run out convincing winners, with Chris Wood, Ashley Westwood and Barnes on target. 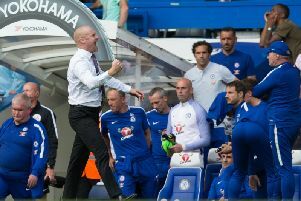 Dyche said: “I think when you’re 1-0 down - a bit unfortunate to be fair - early in the game, and include that, yeah, it’s up there. “The mentality and calmness was key. I was really pleased with the calmness. “I think we’ve shown that since Christmas more so, the players have kept to their shape, done all the simple things well, and they’ve done that again. “We equalised early, which helps, and I think we were asking questions all the way through, particularly the first half. “We go in front, and I think they missed a big chance with Wilson, but didn’t create that much really after that until at the death. “We did, we were probing and asking questions, and I think when you add it all together, and the professional diligence to see the game through, it’s not too many questions asked, I’m really pleased, because they’re a good side, you know what a fan I am of Eddie and what he does here. The win made it 24 points since the halfway point of the season, when Burnley were in the bottom three with 12 points, and Dyche added: “Since Christmas, 24 points now, in 14 games - still work to be done, but that’s a fantastic return. “I’ve been pleased with the staff’s calmness as well, it’s not easy when you’ve had a first half of the season like we did, a lot of challenges. “I like to think I’m quite controlled about the challenges, some are in your control, some not, and it’s seeing the thing in your control, reacting to them and changing them. “We’ve done that well as a group, everyone involved. “With performances like that, you can see how, our return in points has been earned. “Now and again I like to cry it in, and we’ve had a couple where things haven’t gone our way, decisions and the like, but we’ve stayed true to the task, to keep performing and keep looking to win games. “We had a recent run of four losses, and I said we weren’t miles away from where we were performing, sometimes you need a thing to go your way, a moment, but you want to earn those moments. “I didn’t think we were performing badly, we were doing some good things. Dwight McNeil again shone - a month since giving Liverpool right back Trent Alexander-Arnold a tough afternoon at Anfield, he forced Eddie Howe to withdraw his understudy Nathaniel Clyne at half-time: “He continues to enjoy the challenge and grow in his performances, and his understanding of his and the team performance. “He’s doing a very, very good job. “But there were some really good performances, Lowts came in last minute - unfortunately Bardo had an accident at the training ground, slipped and slashed his leg from some wood, believe it or not. “But Lowts did a good job, the centre halves were diligent and calm. Charlie Taylor continues to improve, Dwight obviously, the midfield two were excellent - Westy is having a fine second half of the season.